Ocean Drive Beach Rentals offers guests the opportunity to book an extended stay during the off season months, October through March. Whether you want to escape from heavy snows and sub-zero temperatures, or simply gaze at the sunrise each morning and play golf in the mild afternoons, we have a North Myrtle Beach rental property suitable for you. Prices are affordable, and all utilities are included in your monthly price. Unlimited access to amenities are also included with resort properties. Call (855) 484-6847 to speak with one of our rental professionals. The off-season months of October through March are a great time to visit North Myrtle Beach. Visitors pick the Grand Strand because of the mild temperatures, fewer beach crowds, great restaurants, and year-round attractions and amusements. The family fun doesnt stop after the summer, with several area festivals such as the Endless Summer Festival, the South Carolina Bluegrass Festival, the Little River Shrimpfest, and North Myrtle Beachs annual Christmas Parade on Main Street. Don't forget to check out our North Myrtle Beach events and news to see what else is happening during the off-season months! Myrtle Beach and North Myrtle Beach attractions, activities, dining, and live entertainment are still open and available during the winter months, so you can experience everything our unique area has to offer. Sample local Calabash-style seafood and cuisine, explore fantastic parks and beaches, enjoy live shows, and play dozens of courses. Live entertainment venues along the Grand Strand offer special shows for the Holiday season. Youll also find the best deals and unbeatable shopping at both Tanger Outlet Malls in Myrtle Beach. At the end of the day watch the moon rise over the ocean from your private balcony and prepare dinner in your full size kitchen. Large living rooms with cable TV and DVD players make it easy to relax after a long day of exploring the area. Theres a reason why the Grand Strand was labeled the Seaside Golf Capital of The World. Many top-ranked golf courses are just a short drive from the resorts and vacation homes of North Myrtle Beach. Our mild climate is perfect for year-round golf, especially during the off-season months. Youll be able to find discounted fees through coupons and discount booklets for most courses, or call us for more info. 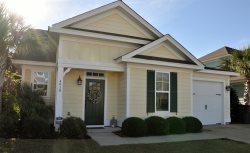 This time of year, we offer a lot of flexibility with our North Myrtle Beach vacation rentals. Weekend and monthly rentals seem to be most popular but you still can vacation with us on a weekly basis if you choose. Both nightly and weekly pricing is displayed on each individual property page. Monthly prices usually range from $825 - $1500 and include all utilities in the rental price. You wont have to worry about paying a separate fee for electric, water, or cable; its all taken care of for you! Check out our vacation rental properties to see what sparks your interest, and give us a call at (855) 484-6847 to inquire about a monthly price. We would love to host you for the winter season!